Raaga.com: Has TV Comedian Kapil Sharma clandestinely married? Has TV Comedian Kapil Sharma clandestinely married? Till now it was the Bollywood stars who kept their romance under wraps but now it seems even TV stars have become conscious and have begun hiding their personal affairs from the media. If you don’t believe then check out the latest picture of TV star and most popular comedian Kapil Sharma of the famed TV show ‘Comedy Nights With Kapil Sharma’ dressed as a groom doing the rounds on social networking sites. Rumors have it the popular comedian had taken his audience on ride by faking his absence from the TV show ‘Comedy Nights With Kapil Sharma’ on the pretext of his illness. Instead it is reported Kapil Sharma had taken the break to marry. 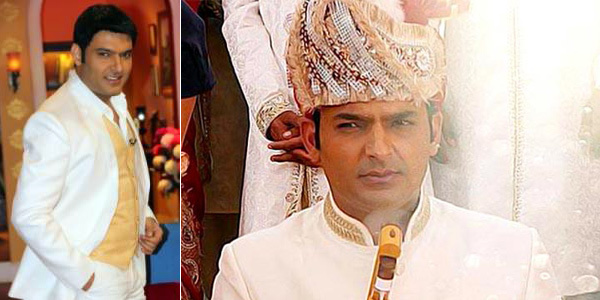 The picture of Kapil Sharam, dressed in the traditional sherwani and sehra sitting in the wedding mandap alongside a blur picture of his bride have raised speculation that the comedian has clandestinely married! What’s more the comedian is also making a comeback on his TV show ‘Comedy Nights With Kapil Sharma’ with this week. Colors channel have released a short promo video of this week’s Comedy Nights announcing the comeback of Kapil Sharma. Isn’t it a coincident that Kapil Sharma is making his comeback on the TV Show at the same time when his ‘secret marriage’ is over. If readers are wondering who is the lucky girl who has married Kapil Sharma then rumors mills suggest that Kapil Sharma has tied the nuptial knot with the producer of his popular TV show ‘Comedy Nights With Kapil Sharma’!